The silver frame display cases are ready to be used right from the shipping crate! First, each store fixture is preassembled, and in-stock for shipment the same day when ordered before 1PM EST, Monday – Friday. 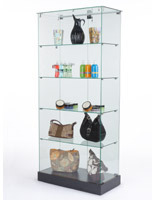 The locking display cases that secure expensive merchandise deter theft of goods displayed within. Two keys are included for the dual locks. The double doors on the glass cabinet swing outwards, allowing easy access for any employee to retrieve items out of the case. 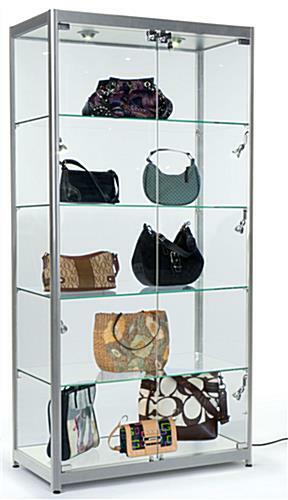 The free standing silver frame display cases will remain stable on any floor due to levelers built into the feet. 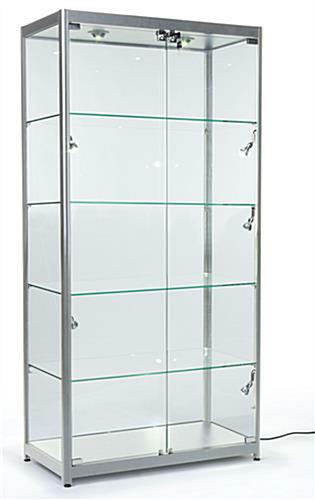 The locking glass cabinet comes with (4) glass shelves that are .265mm thick. The surface area where products can be placed on each shelf is 38"w x 14-1/4"d, this allows for several items to be displayed in the case with ease! These silver frame display case's glass gives off a nice green tint from the side, as it is tempered, green-edged glass. The locking cabinet has a contemporary vibe with the sleek, silver aluminum frame. The silver frame display cases call attention to themselves! However, once removed from the crate, there is no assembly whatsoever required, saving both time and money! 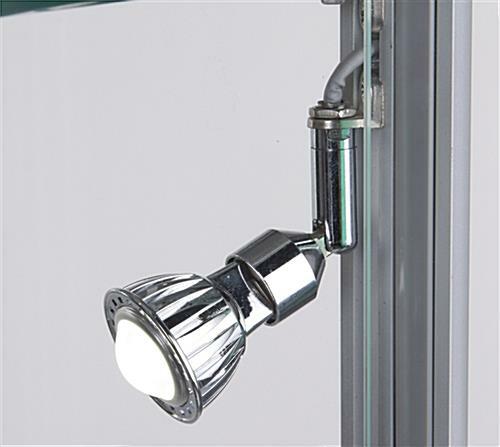 The glass locking cabinet comes with (8) 20 watt halogen lights. The silver frame display cases have dynamic lighting, as each fixture can be adjusted to illuminate merchandise from just the right angle. 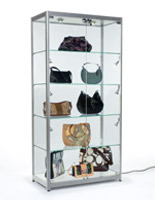 The locking glass cabinet comes with (2) top lights that swivel and (6) side lights that swivel up, down, left and right! The silver frame display cases are constructed from tempered glass, an anodized silver aluminum frame and MDF with silver melamine. 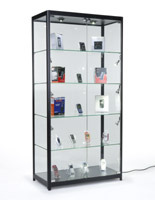 The locking glass showcase frame is rounded with a silvery finish on all the corners of the display! 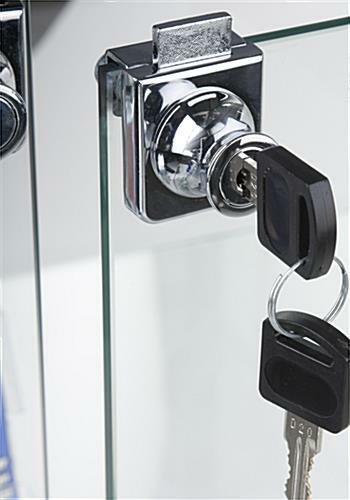 All the hardware on the locking glass cabinet comes in a sleek chrome finish to give an added elegance to the unit. 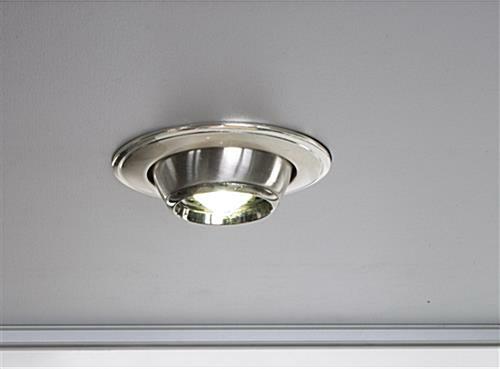 The locking glass cabinet comes with a hidden power switch on the ceiling of the display and features a 92" electrical power cord. Please note the unit is very heavy may require more than three people to remove case from the shipping container.